Two dozen delegates attended the first meeting in Charlottetown to discuss the possibility of a federal union. The fact that the idea of federalism was put on the table at the outset is important. The United States was a federation and its example was obvious and important to consider. But Britain was a legislative union: there was parliament at the top and the next level of government down the chain was municipal. Macdonald, for one, favoured legislative union partly because he was a fan of British institutions generally (like many of his Victorian peers). But also, he distrusted federalism because of where it had led the United States. He had a point: in 1861 the Union had been dissolved in war and, as the conflict raged south of the border, more than 600,000 lives were lost. Every day the meat-grinder of the Civil War churned on, Macdonald could point to it as an argument in favour of a strong central administration rather than the weaker bonds of federalism. This meeting, known as the Charlottetown Conference, took just over a week, from September 1 to 9, 1864, during which enormous amounts of liquor, food, and cigars were consumed. The wives of the delegates have been credited with smoothing much of the ego-strewn road to agreement and goodwill. It is worth noting that this pivotal meeting in the evolution of a new constitution competed (rather badly) with a travelling circus that was visiting Charlottetown the same week. There was no room for the Canadian delegation in the local hotels, and they were obliged to spend their nights on board their ship. 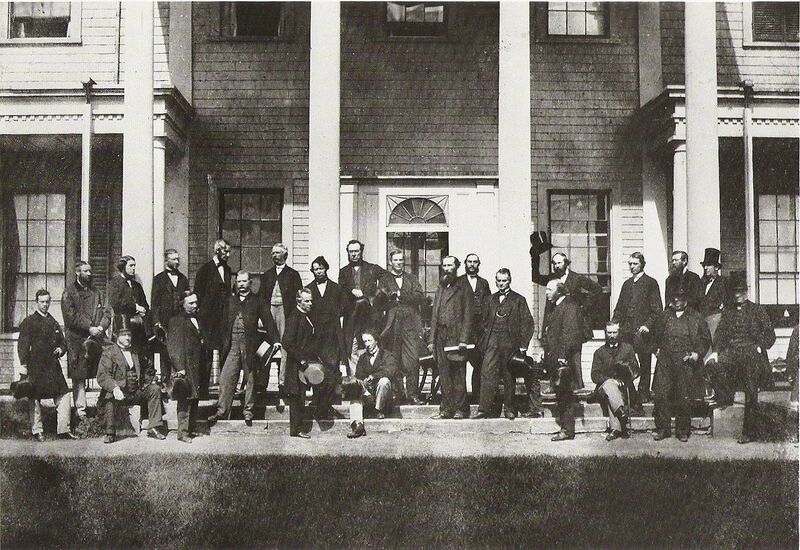 Figure 14.7 Looking a bit worse for wear, the Fathers of Confederation gather for one of Canada’s first photo-ops. (Note Macdonald, sitting.) Photo by George P. Roberts. A month later, in October, an expanded delegation met in Quebec City to resolve the finer points of the agreement. These took the form of the Seventy-Two Resolutions (a.k.a. the Quebec Resolutions), 50 of which were believed to have come directly from the pen of John A. Macdonald. Certainly his taste for a more powerful central government worked its way into the resolutions, but he knew better than to alienate Canada East and the Maritimes. The colonies, it was agreed, would become provinces. Canada would be once again severed at the Ottawa River, and Ontario and Quebec would emerge as provinces in their own right. Also agreed was that the central administration would be responsible for agriculture, the post office, fisheries, criminal law (but not civil law so as to safeguard French-Canada’s distinct tradition in that area), and the final word on immigration. The federal government would retain residual powers that covered everything necessary for the peace, order, and good government of the country. The breadth of the residual powers has been subject to intense legal and political debate ever since. The provinces received jurisdiction over education (which allowed local authorities to address the incendiary issue of separate schools for Catholics and Protestants on their own terms), health care, and most natural resources. While Ottawa would be able to tax trade through tariffs, the provinces could raise revenues through resource extraction royalties and property taxes. Roads and other infrastructure were nominally a provincial responsibility but in practice any highway or railroad that was of national importance became a federal responsibility. Two other areas of jurisdiction fell to the federal administration: marriage and divorce, and exclusive responsibility for Aboriginal lands and reserves. As well, Ottawa had the power of “disallowance,” that is, the ability to reverse provincial legislation that it did not like. In this respect, Macdonald and others who valued a strong central state were successful: Ottawa was to be the senior level of government rather than the first among equals. The elements of the federal government included an elected assembly (the House of Commons) built on the principle of representation by population. As this set-up would leave the Maritimes vastly outnumbered, concessions were made at the level of the appointed (that is, not elected) upper house, the Senate, where each of Ontario, Quebec, and the three Maritime provinces together would have 24 seats. Naturally, the principles of responsible government would prevail and the form of government would thus very closely resemble that in Britain. There were two avenues for passing the Seventy-Two Resolutions: via the people and via parliament. The delegates agreed that a popular referendum was a bad idea, given that public support was strong only in Canada West. The parliamentary alternative was to take the package to each colonial legislature for approval before sending it on to London. This strategy had drawbacks, too, because each assembly contained articulate and persuasive opponents to the proposal. Nevertheless, this was the route taken. In Canada East the prospect of federal disallowance in a House of Commons dominated by Anglo-Protestants (many of them rabid anti-Catholics drawn from the ranks of the Orange Lodge) was like putting the fox in charge of the henhouse. (Canada East’s Protestants, it should be stated plainly, felt the same way about a Quebec provincial legislature dominated by Catholics, and predicted the doom of their own denominations.) Antoine-Aimé Dorion, the leader of the Parti rouge, led the opposition to the scheme, describing it as assimilation by other means. Cartier’s response was to emphasize the extent to which Quebec would have control over its key cultural levers, that bilingualism was going to be official at the federal level (as well as in the Quebec Parliament — though not in any other), and he reminded his colleagues of how the ongoing stalemate in government that was the principal legacy of the Act of Union was not going to cure itself. If Canada East wanted effective and ethnically fair government, he maintained, it would have to come through Confederation. Cartier received support from the Catholic clergy, which feared the assimilationist possibilities outlined by Dorion but feared the Parti rouge even more. Canada — West and East, English and French — voted in favour of the constitutional agreement, although francophones were the least enthusiastic. Alternative forms of union were considered; a federal state was one. The Seventy-Two Resolutions set out that the federal state would divide its powers between the provinces and Ottawa in such a way that culture (education, health care, welfare) would be provincial while trade, fisheries, and common concerns like the post office and defence would belong to Ottawa. “Residual powers” were barely defined and were to reside with Ottawa. Not everyone agreed that Confederation was a good idea, not even in Canada. 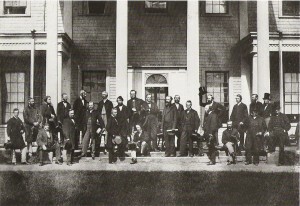 Charlottetown Conference Delegates, September 1864 by Skeezix1000 is in the public domain. 14.4 Crafting a Constitution by John Douglas Belshaw is licensed under a Creative Commons Attribution 4.0 International License, except where otherwise noted.